Are you experiencing any of these problems with your home freezer or commercial walk-in freezer? Is there a frost buildup inside the freezer? Does your freezer seem to run or cycle longer than it should? Is the freezer making strange loud noises or running nosier than it should? Does the freezer have power? Is the freezer too warm even though you checked the thermostat? The root of your broken freezer could stem from any number of problems, such as a leaky door gasket, failing self defrost system, bad compressor, broken defrost thermostat, problematic internal temperature gauge, low refrigerant levels, or a break in the wiring. You can try to fix your freezer yourself, but be aware that many types of freezer fixes require an EPA certified technician. In these cases, attempting to repair the freezer yourself will void the warranty. 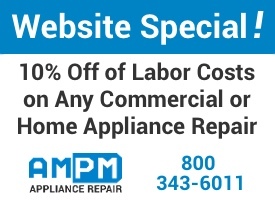 Contact AMPM Appliance Repair at 800-343-6011 and we’ll send one of our trained freezer repair technicians to quickly diagnose and fix the problem. 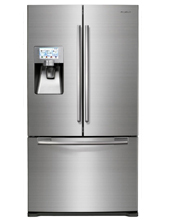 Our freezer repair techs carry a vast inventory of parts for all makes and models of appliances to ensure that we can handle just about any type of residential or commercial freezer repair on the spot.